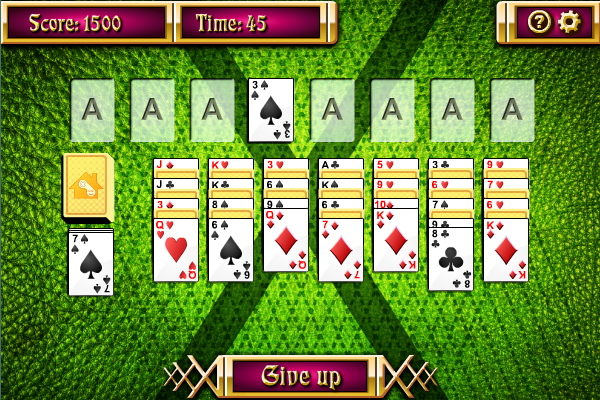 Join the league of solitaire elites and see if you can conquer the difficult Alternation Solitaire! Using 2 decks of standard playing cards, your goal in this game is to move all cards by suit from A to K to the foundations. When the game starts, 8 empty foundations will be located at the top of the screen. Each of the 7 tableau piles below the foundations will be dealt 7 cards alternating between face-up and face-down, i.e. the first card on a tableau pile is face-up, the second card is face-down, the third card is face-up, and so on. The remaining cards will be placed face-down to the stock pile on the left of the tableau piles, and 1 face-up card will be dealt to the discard pile below the stock pile. The tableau piles are to be built down by alternating colors, and each time you can move a card or a group of cards to another tableau pile according to this rule. The face-down cards on the tableau piles will be turned face-up when the cards on top of them are removed. If a tableau pile becomes empty, you can move a K or a group starts with a K to it. The top card on the discard pile can be moved to a tableau pile or a foundation. If you have run out of moves, you can click the stock pile to deal a new card to the discard pile. But if the stock pile becomes empty and you cannot make any more moves, you lose.